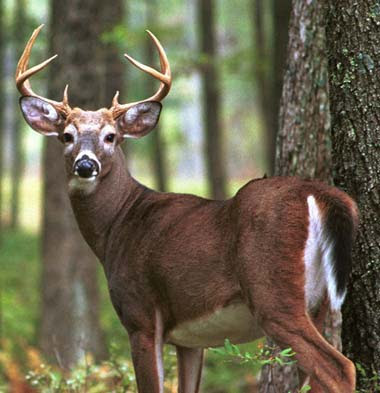 White-tailed Deer in the late 1800's had dropped from fifty million to near extinction!Public outcry saved the animal & now there are approximately eight million in the U.S.to enjoy! Deer are very flexible, ready & alert to change plans & either hide or bolt on a moment's notice! Do ewe know how much a "Buck"is worth these days? There are over thirty times that deer are referred to in the Bible.The terms roe,hart,roe buck, hind, & fallow deer are all terms the Bible uses.Tame deer are a picture of loyalty, contentment, affection, & grace! Mothers take precautions with their fawns by thoroughly bathing their newborns with their tongue!This eliminates any scent that may betray its presence.The mother will lead the fawn to a place of safety when it's able to walk. The fawn will lay motionless,learning the art of camouflage,blending its spotted body with the surroundings. 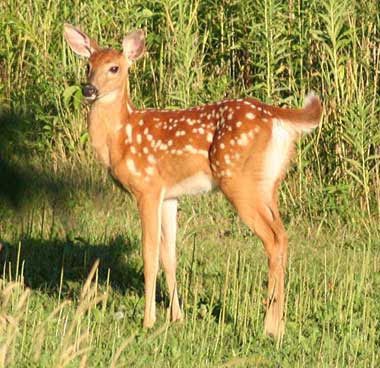 I'm a "Spot-on"favorite for Fawn of the Year! I can use the Doe! 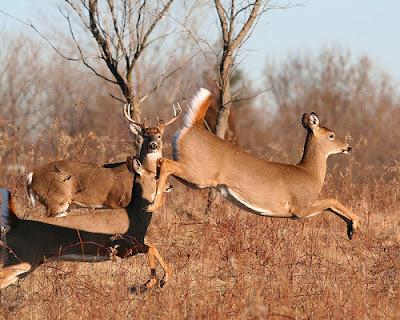 Deer are surefooted,leaping over difficult barriers & lifting their white tails high to signal danger.They live in a constant state of readiness,flexible to change plans on a dime! The "Tail of the tape" says that when danger appears,"High-Tail" it out of there! Sheep operate in much the same way as deer. 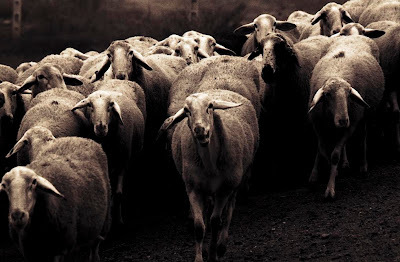 When sheep sense any danger,all it takes is a few sheep to start running & the whole herd frantically follows.It takes the flexibility of the Shepherd to drop everything , take care of the threat, & restore order to the "frazzled" herd.Flexibility is defined by Webster as:adjustable to change;capable of modification.Shepherds must possess flexibility! Ewe better hurry! Ewe never know what's chasing us!I just know it's hungry!